Jackie from Kirkcudbright bought this item recently. Another of our popular fishing t-shirts, designed and printed in UK. 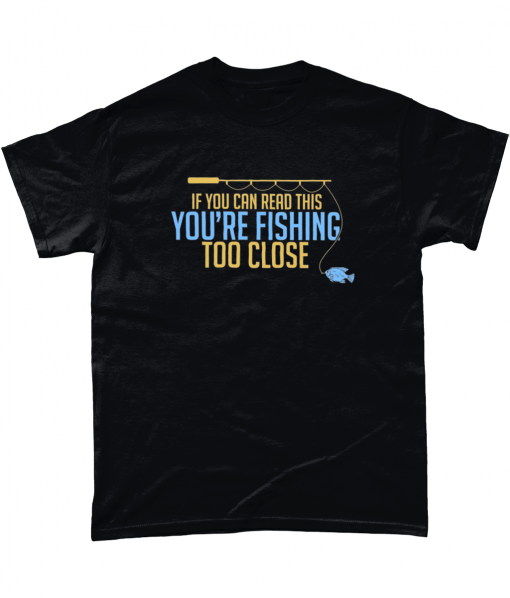 Make a statement while maintaining a laid-back cool look with this ” If You Can Read This You’re Fishing Too Close ” t-shirt. Perfect for any time of the year and packed with personality, this funny fishing t-shirt features a clever message and artistic design! Makes an awesome gift for the fishing lover in your life who loves funny angling tees. Can you do it as a hoodie? Thanks for your order and for leaving your review! Yes we can offer almost all our designs on all sorts of clothing including hoodies. Please contact us for more info.